As we age we become more and more conscious of you skin and how it looks. Years ago I started to notice skin ageing on others and determined not to look older than I needed to and where possible try to defy the ageing process and look younger than my years I began with the basics of good skin care. What are these? They are pretty simple, I wear a factor 50 every single day 365 days of the year. I put it on automatically in the morning whether I am planning on going out or not so I am prepared. I also drink as much water as I can get in me daily which isn’t always easy but I do try. Now these are the very basic in maintaining good skin. In addition a healthy diet can help keep skin looking great. That’s the basics covered. You may have noticed I have been carrying out trials of various beauty products and of course sharing the results with you. 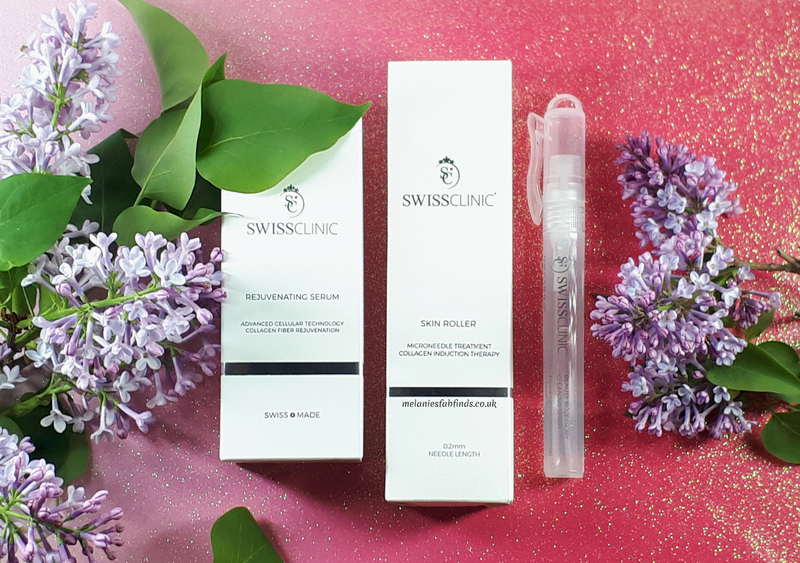 I only include products that work on my blog and the latest that I have been experimenting with is the award winning skin renewal treatment from Swiss Clinic. Swiss Clinic specialise in targeted and innovative beauty treatments of premium quality but at an affordable price. These are clinically tested to show their efficacy and give long lasting results. The Skin Renewal Treatment reduces the appearance of scarring, hyperpigmentation and also improves the structure of the skin. 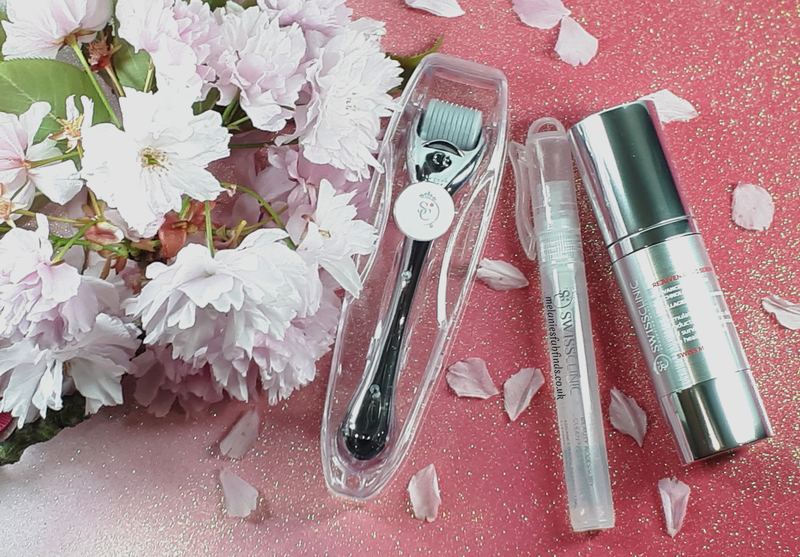 The treatment requires the use of a skin roller and rejuvenating serum and there is a sanitising available to clean the roller. 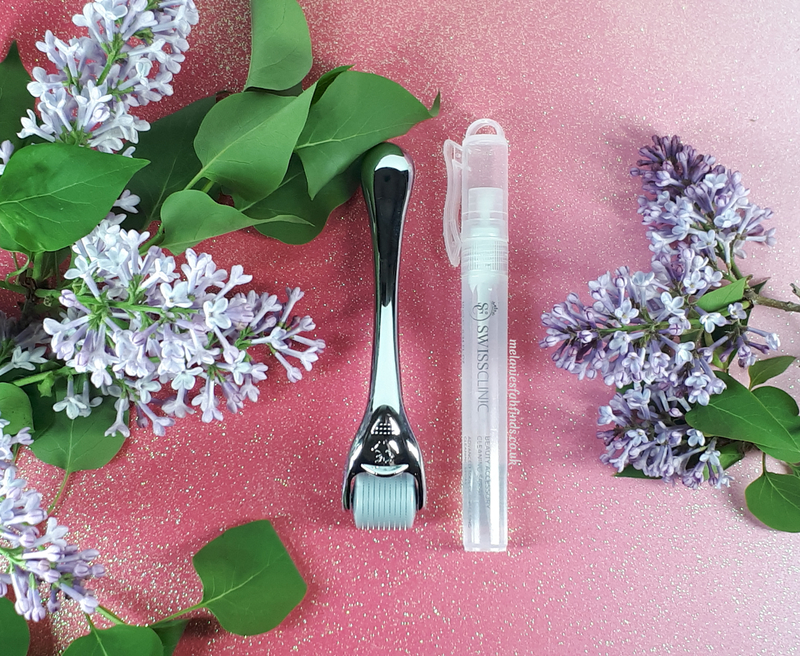 The roller itself is a microneedling device with 540 silver-plated, Japanese surgical steel microneedles specifically designed for at-home treatment. I am predicting a few of you will be thinking, “what??? No way. I’m not trying that!” (yes I do read minds on occasion). But fear not it doesn’t hurt!!!! I used the 0.2mm roller (length of the needles) but there is a 0.5mm option available – can’t say if that one hurts or not. You can buy these individually roller £42, serum £59 if you like or a pack with both which is selling for £79 at the moment. The sanitising spray comes in packs of 3 for £22. 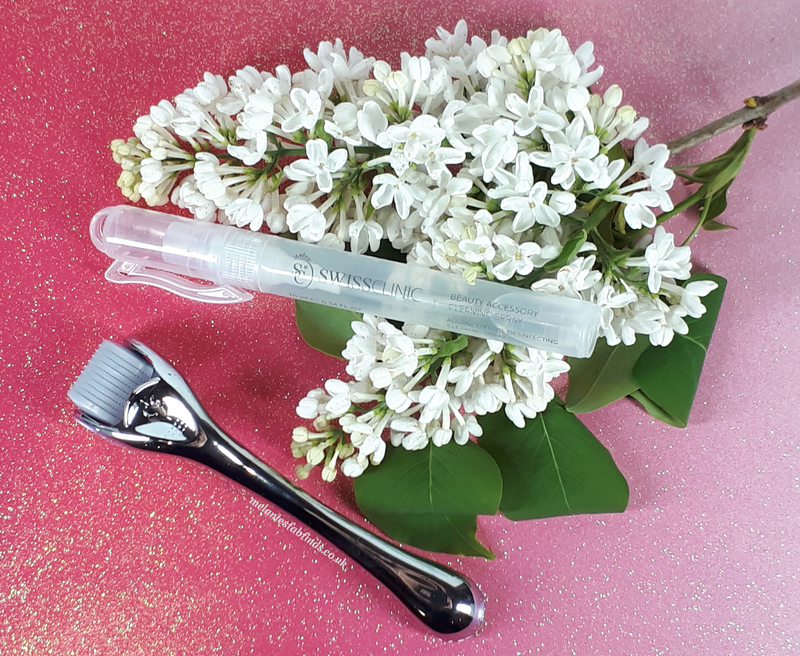 By using the roller you open up thousands of tiny micro-channels in the skin which in turn simulates damage and the skin’s natural healing process; production of collagen and elastin, increased blood circulation and the creation of new healthy skin cells. The micro-channels allow a more significant absorption of the skin care products that you apply hence the serum is applied straight after and then your preferred moisturiser approximately an hour later should you feel you need it. The serum absorption here is up to 300% more compared to use on untreated skin. The serum is not only soothing but also moisturising. The active ingredient beta-glucan stimulates the skin’s natural collagen formation resulting in wrinkles looking less defined. The combination of the skin damage and serum application helps minimise fine lines, reduce the size of pores, fade pigmentation and reduce the appearance of scarring and stretch marks. After using the roller you apply the rejuvenating serum and then your own moisturiser. It’s best to use this at night as you may experience some tingling or a slight redness. The skin needs time to heal in between uses so a 5-day treatment cycle is recommended – 5 days of rolling, then 5 days of rest to allow the skin to recover and renew. 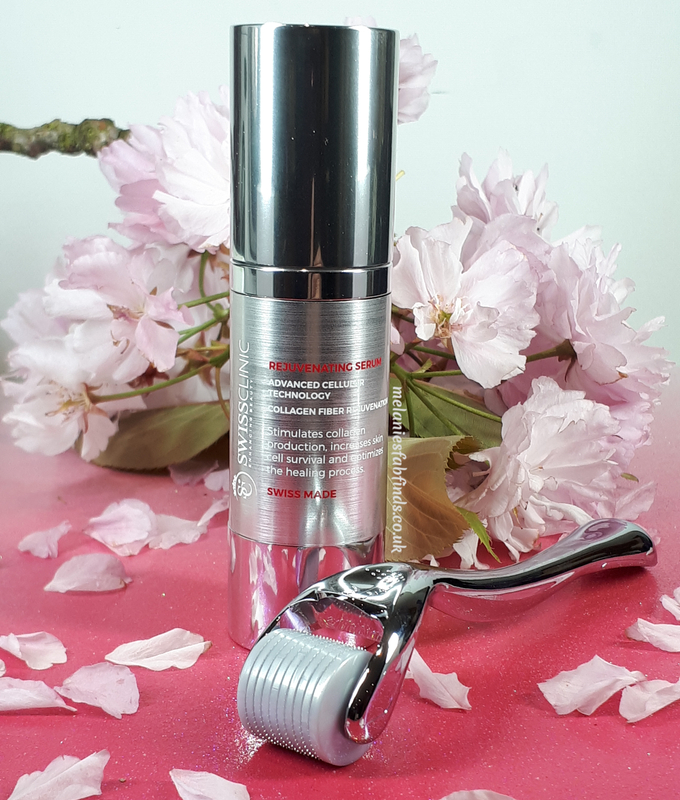 It is advised that the serum is also used on days that the roller isn’t too as it will give better long-term results. With continuous treatment the skin’s natural ability to heal is stimulated and new, healthy skin cells are produced which means that scars will fade and disappear. This is specific for scars and hyperpigmentation but you will also notice an improvement in the appearance of the skin as it will look brighter and more even in colour and also plumper and firmer. Don’t forget after use to use the Sanitising Spray to make sure your roller stays clean. I had tried acupuncture during pregnancy for morning sickness which was a traumatic experience so I was was a bit apprehensive at first. Once I started using this I quickly realised there wasn’t anything to worry about as it didn’t really cause much discomfort just a tingling after use. It doesn’t take up much time to do, you only need to use the roller for 2-4 minutes each time which is great. This is really easy to use and the fact that the serum is in a pump bottle makes the whole process faster and simpler. The serum can be stored in the fridge so it’s really nice an refreshing on application. I found the best time to use this was at night and notice it was quite relaxing using the roller on my face. It gives you a light massage which is always a good thing. The treatment isn’t limited to use on the face, you can also use it on the neck, chest, arms and backs of the hands or anywhere else you feel you may need it. The treatment seemed to work well for me. I noticed my skin was firmer, felt smoother and had a much better tone then when I started using it. My skin looked healthy! I will add there was a considerable gap between this and the previous beauty product trial to undo any positive affects from the previous trial to allow a good assessment of this one. All the Swiss Clinic Treatments are cruelty free and vegan!!!!! Is this a product you would consider using now that you know it works? You’re tempted now aren’t you, go on admit it. One lucky reader is going to get to try this out for themselves. I have one prize to giveaway of the Skin Renewal Treatment to giveaway. Disclaimer: I was sent the Skin Renewal Treatment for an honest review. All thoughts and pictures are my own. Please do not use my pictures without permission. I would like to try it to help with my fine lines (wrinkles)? I would like to try it to help with the wrinkles by my eyes.I imagine to feel really relaxing. You can choose from two needle lengths depending on how brave you feel. I’ve read about this type of treatment and would love to try as it sounds really intruiging! I’d love to give this a go as I’m 46 and my skin is really beginning to show it’s age! I’m sure you would see an improvement with this. You can use it there too which is great. What a lovely skincare product. Im glad the roller doesn’t hurt. I as pleased too. I ws worried before it arrived and I got to try it. I exactly need a pamper session bfore my next travel. I’m sure your other half would be quite impressed with this. I have always been a bit scared of the needles, but my friend got it done and said it was amazing, so i would love to try! I would love to try this set it looks great. Would love to look more refreshed. Skin tone has definitely changed with age! I would love to try it on my forhead. lots of uneven pigment and wrinkles. Many thanks for this great review. I have noticeable scarring from acne and really have been thinking of this sort of treatment but apprehensive about it! Your review is really useful, thanks. I would love to win this to help my skin look better. I might try it when I get a bit older for the wrinkles but not yet. love to remove some wrinkles and give my skin a fresher look. I’ve had micro needle rollers before they’r great and really plump up my skin. You just have to be careful in case you press too hard as your skin can go very hard which is ok but not if you’re going out anywhere! I would love to try the microneedling as I would love to improve the look of my skin and reduce the fine lines and wrinkles. I can deal with laughter lines but not deep, droopy ones. I would love to try this. I’m definitely getting wrinkles and I’d love to try this. I would like to try this to see if it helps with my skin, need lots of help with blemishes. It all depends on their depth. Deep lines may appear less apparent. Definitely! I’m really noticing a slackening of the skin on my face in the last year or so – not really bad wrinkles, just less firm. I would love to try this. Thanks for the opportunity.Good Luck everyone. I’ve tried microneedlng before and been impressed by the results. I would love to try this to reduce any fine lines on my face. I’ve actually been thinking about purchasing one of these for a while! I’d love to see if it can smooth out some uneven skin tone I dislike! i spend a lot of time outdoors, so my skin is a victom of the elements, especially my squint lines around my eyes. i’d love to try it just to improve my skin in general. I would love to win this, after suffering with acne for just over 2 years I am left with redness and acne scars, which really effects my confidence. I haven’t tried it, but it’s something I wouldn’t mind giving a go. Yes,I’d love to try this. I need help with ageing skin. I also get little spots under the skin on my forehead and am losing elasticity, I would love to improve the tone of the skin on my face.